AA6E Station Log: SB-220 Amp, need new tubes? My station has a trusty Heathkit SB-220 amplifier for those times when 100W is not quite enough. I don't use it a lot, but I am considering whether it's time to get a new pair of 3-500Z tubes. The amp was built by Paul Gallier (WQ1C, now SK) in 1972. Paul upgraded the amplifier with many of the recommended mods, including new power caps, QSK switching, bias cutoff, etc. 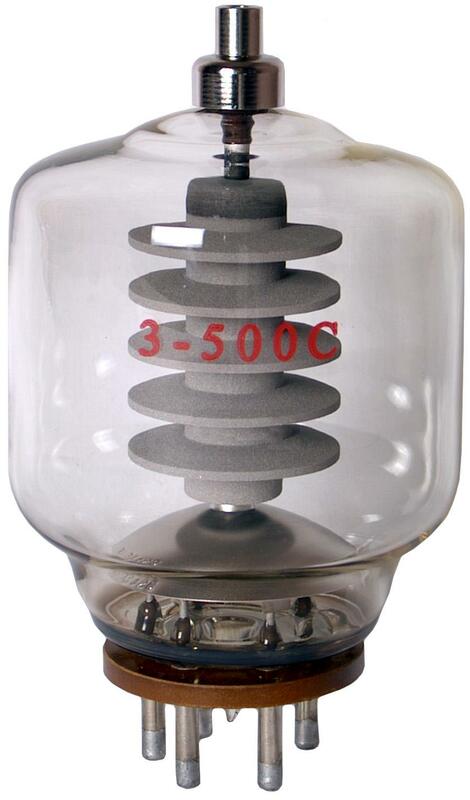 But so far as I know, I still have the original Eimac 3-500Z tubes. 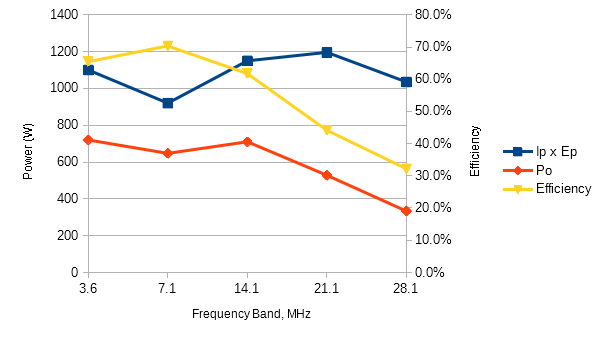 The amplifier seems to work well, except that it's hard to get full power output on the 10 and 15 M bands. I had data from WQ1C that suggested that he was getting fairly constant power output across 80 through 10 M at the time I bought the amp, some 10 years ago. Time to make some measurements of my own. Since there are a number of settings that can be twiddled, it is hard to know exactly how to make a comparison. You can adjust drive level (Flex 6500 output), amp tuning and loading. I settled on CW mode, with the amp switched to its low voltage "CW/Tune" setting. I looked for maximum output power (Po) with various drive and loading settings, at the maximum allowed grid current (Ig) of 200 mA. Po is measured with an LP-100 RF Wattmeter feeding a Drake DL1000 dummy load. The results are shown in the figure. I plot the DC input power (Pdc = Ip x Ep), output power (Po) and efficiency (Po/Pdc). Clearly, there is a problem with 10 and 15 M, which show low output power and efficiency. At 10 M, the output power has fallen by 3.3 dB -- about 1/2 S-unit. It's good to have data. Now the question is whether getting back that 1/2 S unit on one band is worth the cost of new tubes. Short of that, there is the possibility of reducing gas by "gettering" the tube -- running with high dissipation (plates glowing red!) -- which activates a special gas-absorbing getter material covering the plates. Note added: Running with bright glowing anodes is dramatic, but I have to wonder if it is safe for the SB-220. The cooling "system" (fan) is rather primitive. It seems to be OK for normal ICAS operations (plates dim if red at all), but when dissipating power at the maximum spec. (500 W) for any length of time, you have to worry. I understand that a particular issue is cooling of the anode and base connection pins, where a sustained overheating will compromise the glass seal, letting the vacuum out. So aggressive gettering is probably not a good idea with the stock Heathkit. It would be handy if we had a way to measure those critical seal temperatures.